In that statement alone, it’s easy to see how truly powerful Tenstreet’s Xchange network has become since its inception just eleven years ago. Nearly 30,000 different companies are using Xchange – at no charge – making it one of the most formidable employment verification systems in the trucking industry. Xchange is a network effect success story that has revolutionized the industry. This blog will follow a question and answer format, with the majority of the questions collected from the attendees on our Xchange 2.0 webinar conducted last month. If you have further questions, please add them to the comments section below, and we’ll be sure to answer them! Xchange is a web-based service made for providing and requesting ANY employee records that allows you to manage all your requests in minutes, freeing you from the ball and chain of the fax machine. What’s more, it accelerates the employer verification process regardless of whether or not that employer was regulated by the DOT. So how will Xchange 2.0 make it even better? You’re used to Xchange being able to quickly manage all past due verifications, with the easy re-sending of requests for email, network, or fax providers. In Xchange 2.0, that’s even easier now with the addition of one-click auto-ordering. All the employer and education requests that are eligible – meaning those which are listed in the Tenstreet public or private directory – are indicated with a lightning bolt, and can be requested with just one click. Simply put, processors gain huge efficiencies in productivity, allowing them to order everything at once, saving a ton of cognitive overhead (as well as mouse clicks). When will it be live, and what can I expect? We’ll be rolling this out in two parts. This Tuesday (December, 12th, 2017), you’ll see the updated user-interface. Within the following week, the green Xchange Auto-Request functionality will be rolled into production. Existing functionality will not be affected. What does the Lightning Bolt mean? These are listings that are eligible for ordering and will be included when the green Xchange Auto-Request button is clicked. What about those employers that the driver has selected ‘Do not contact’? If a driver has selected ‘Do not contact’ for an employer on his application, the Tenstreet auto-requestor will exclude it from the order. The option of contacting these employers at a later date will always be available. How can I see the last time a request was sent? Hover your mouse over the lightning bolts to see the last time that specific request was sent. How will I know which requests will be processed in an auto-order? The top-left summary rectangle will provide a count of the requests that will be included when you click the green Xchange Auto-Request button. This handy tooltip will appear upon hover, as an explanation. Will there be any new preference settings with Xchange 2.0? 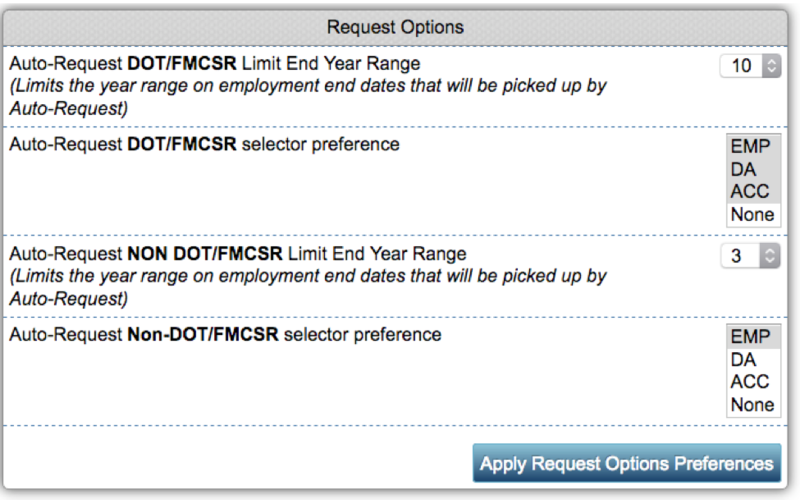 Yes, we’ve included new options to your request preferences. These allow you to set up Xchange in a way that makes the most sense for how your company operates. You will find two additional selector preference settings for DOT and non-DOT auto-requests. For each of these employer types, you can select if you’d like for your orders to include an employment, drug and alcohol, and/or accident. Or you can choose none, which essentially equates to disabling auto-ordering. Additionally, you can choose the year range limit for DOT and non-DOT auto-requests. These are defaulted at 10 and 3, respectively. What are the resend timeframes? Xchange handles the resend timeframes behind the scenes, restricting the time between resends to 24 hours for Fax and Network, and 1 hour for Email. In our next upgrade (early 2018), Xchange will automatically resend requests based on these timeframes. Is it searching from public directory and/or private directories? It depends on what the applicant entered on the IntelliApp, but it can use either one. What is the difference between a public and private directory? The public directory is made up of companies who have agreed to be listed in our Xchange Tenstreet Directory. They usually receive a lot of requests and like having their information accurately listed in the directory for any company to use. The private directory is created by and exclusive to each carrier, should they need to send a request to a company not listed in the Tenstreet Public Directory. These are automatically saved on the carrier-side in their private directory to be reused again if ever necessary. As a Network Provider responding to a request, will Xchange automatically mark it ‘Complete’? Or will we get the same requests repeatedly when employers see that they can resend? Xchange will automatically mark the responses as ‘Complete’. ‘Pending’ and ‘Awaiting Authorization’ are the only two statuses that will trigger a resend. Is there a way to set the Request Options preferences for an entire company instead of each employee individually? Not today – all preferences are made on an individual basis. When this goes live, will it automatically be available for everyone, or do we have to turn it on? It will be available for everybody, you won’t need to do a thing but reap the benefits! Can you uncheck things that you may not want to order yet? Yes, you will still be able to order in the same way you always have – you just would not push the green Xchange Auto-Request button, instead clicking ‘Request These Items’ button at the bottom of the screen, as normal. What if I don’t want to ever auto-order? The auto-order feature is just an added convenience. The Xchange functionality you’re used to has not changed. If you do not wish to auto-order, simply don’t click the Xchange Auto-Request button. Alternatively, you could change your preferences to ‘None’, which effectively disables the auto-order functionality. How can I become an Xchange provider? Any carrier can provide their verification via the Xchange network at no charge. 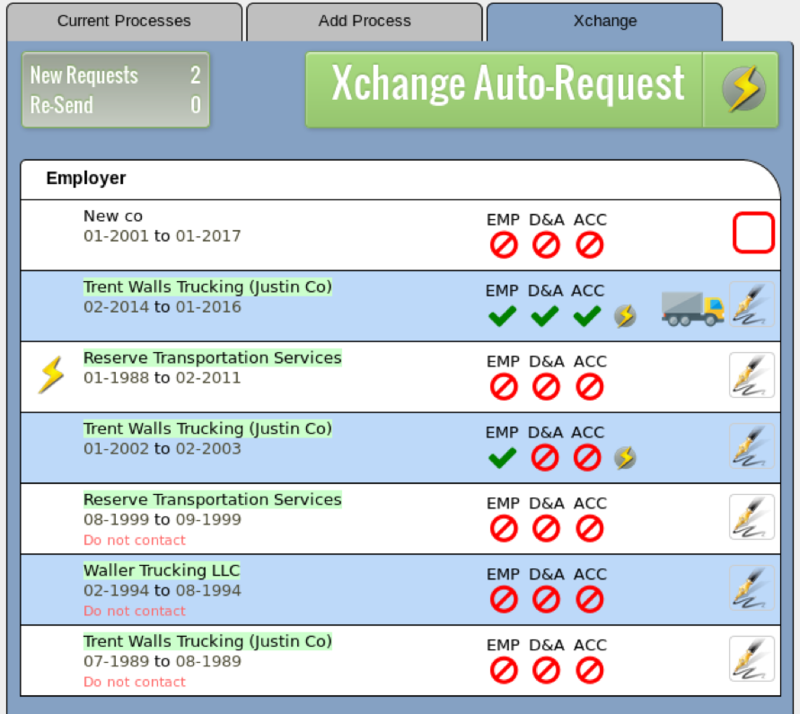 Xchange completely revolutionizes the driver employee verification process, and it’s free. Become a provider today! Can I see the webinar? Yes! Just click the button below. If you have any further questions, please list them in the comments below, and we’ll answer them as quickly as possible. Or if you prefer, reach out to your Account Manager for further assistance. Often the do not contact former employer may be left not updated on an intelliapp from 2,3,4 employers ago. I understand that an applicant may not want a current employer contacted. Beyond current employers, the auto request should override the do not contact when it is not the current employer. Per DOT regs, we must still contact all past employers within the last 10 years, including their most recent or current employer after we hire them. Thanks, Jeff, for the feedback. We appreciate it, and have added this request to our enhancement list. Thanks, again!